BK5000 1,5 oct. C5-F6 Tubos: 39 mm Prateado Altura : 182-215 cm. Comprimento: 88 cm. Profundidade: 60 cm . Afinação A: 442 Hz. Philharmonic Chimes: Adams Chimes are considered by many to be the finest sounding, truly "in tune" chimes available. Their beautiful tonal quality and unmistakable sound, is the direct result of Adams’ exclusive proprietary brass alloy. Adams chimes are available in three distinct series and are designed to offer the finest sound and construction available within it's respective price range. The extraordinary Philharmonic Series BK5003 Chime set is like no other set of Tubular Bells currently available on the market today. This perfectly tuned set of chimes, offers a tone and supreme quality second to none. Adams Philharmonic Series Chimes successfully reproduce the unbelievable sound of church bells at their finest. Each 11/2 inch diameter, exclusive brass alloy tube of this outstanding instrument, produces a clear, pure pitch with almost endless sustain. Our Philharmonic Chimes are available in either a brilliant chrome plated finish or a beautiful brass satin finish for the ultimate in resonance and sound quality, and the rack is fully height adjustable. 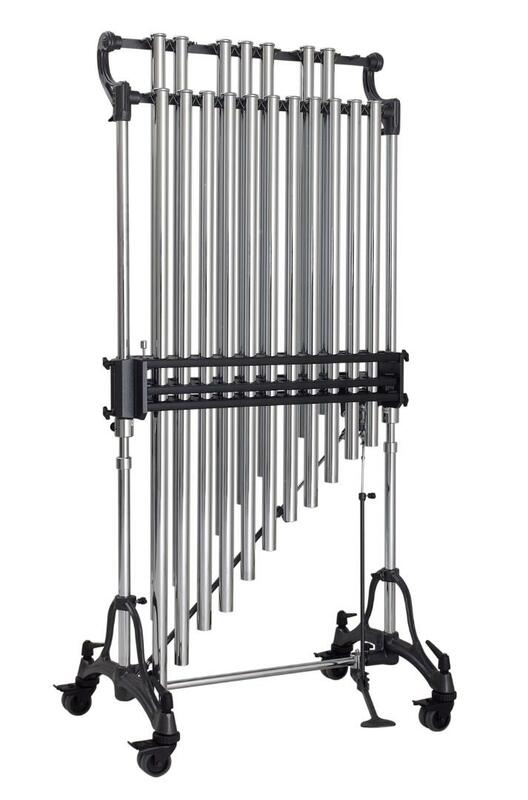 Each set of Adams Chimes comes standard with a full-length, protective cover. Including Stand. Sinos Tubulares Phillarmonic 1.6 Oit.